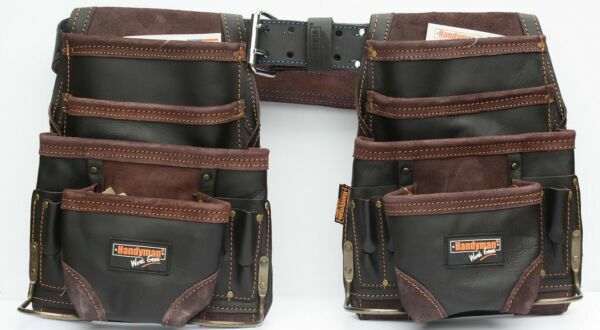 10 Pocket Pro Carpenter/electrician/construction nail and tool bag/Pouch in dark brown heavy duty oil tan Leather (NEW) 2 PACK WITH OIL TANNED LEATHER Tool Belt!! Free Shipping !!! The bag is very sturdy and high quality ... This is the best tool bag you will ever buy !!! This pro carpenter's pouch has 10 pockets for multiple fastener storage and includes a center front pocket ideal for most tape measures. The 2 steel hammer holders allow the convenience of wearing the pouch on the left or right and ideal for both left and right handed users. The full grain leather is durable and ideal for jobsite conditions. Get 2 bags for maximum value !! Brand new 1.75 inch OIL TANNED LEATHER belt. Very high quality, durable, top quality leather. Cuts off to fit sizes 29" - 46"